While nowadays more and more Russians are picked out of the CHL system, the KHL and Russia in general keep on generating good players year after year. This article will feature the top three players out of Russia based on first-year draft eligibility. Older players like Alexander Polunin (born in 1997), who were overlooked in previous drafts but may get picked this year, will not be covered here. The Dynamo Moscow winger is a top talent with excellent puck skills and a good package of size and skating. At 6’3″ and 196 pounds the Penza, Russia, native has an NHL body making him even more interesting from a draft point of view. Kostin has recently been available to teams at the annual NHL Draft Combine. Unfortunately, after a great showing at the Hlinka Memorial, with four goals and seven points, the Russia-Canada Super Series and his KHL debut, Kostin suffered a season-ending shoulder injury. It has been a rocky season for the top prospect, who alternated great performances with relative no-shows. With more time to have a chance to showcase his talent, though, he would probably have managed to get his first KHL points and gain even more exposure. At this point, Kostin can go anywhere from the first to the third round. 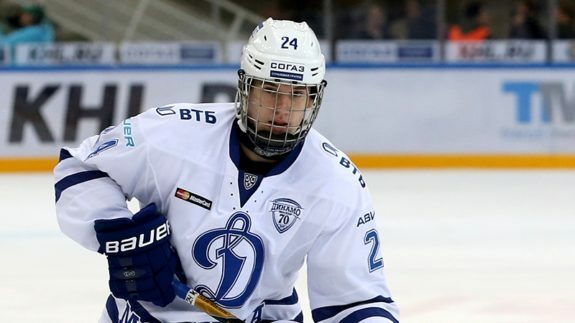 Kostin’s season highlights include a great presence at the Ivan Hlinka Memorial tournament, the game-winning shootout against Spartak Moscow in the KHL, and a good showing at the World A Junior Challenge, where he was actually outplayed by another Russian winger, Andrei Svechnikov. A center with a great set of hands, Lipanov plays a mature game and shows great determination. While not being the best skater in the world, Lipanov can play a fast-paced style with some physical elements which means that he should be able to adapt to the more demanding nature of the North American game without too much effort. Lipanov had a good season back at home, but failed to impress as much as it was expected at the recent U18 World Junior Championships. With that being said, one tournament may hurt a player’s stock for the selection, but will likely have little impact on his career. Lipanov has pro-hockey experience, having spent most of the season with Dynamo Moscow’s affiliate in the VHL, the second-tier Russian league. Lipanov skated in the playoffs and his team won the title, but the young center was mostly busy with the national team during the postseason. Like many European players, he needs to work on his body, defensive game, and work on the dots. Like Kostin, Lipanov took part at the NHL Draft Combine. Once a top-graded prospect, Slepets’ development kind of stagnated a bit for one or two seasons. He rebounded big time in his draft year. Slepets played well in the MHL with Loko Yaroslavl, and especially at the recent U18 WJCs in Slovakia. A gifted forward with a great eye for the net or the pass, Slepets is more of a scorer who can dish excellent passes, especially during odd-man rushes or in open ice. The Khabarovsk, Russia, native had an excellent U18 WJC where he showed great hands, a high level of determination and a strong will to get to the net. He has all the intangibles that NHL teams’ scouts definitely appreciate and that may have caused a rise in his stock for next spring’s selections. Kirill Slepets is not very big (5’10” and 154 pounds) and will need to bulk up and gain more strength, especially in the upper part of his body, to become more of a sure-fire project. His tools, especially skating skills, puck abilities and reading of the game, are definitely worth spending a draft pick on him.